On one of the nights that Chris and I managed to get some alone time, we decided to do a little "date night" kind of thing and I went to Pinterest to find something fun and new. I have to say, I was on the site for a good couple of hours since it's easy to get lost in the website! 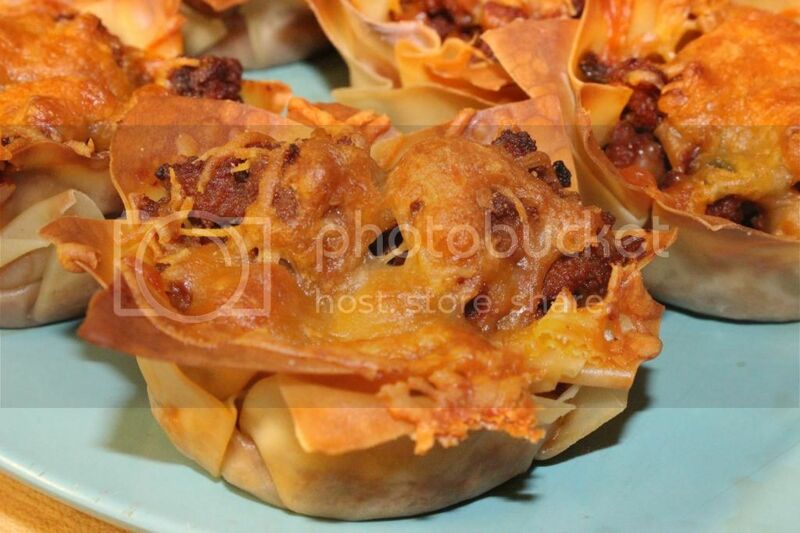 I stumbled upon "Taco Cupcakes" as the recipe was called and I honestly can't find blog post I originally found, but if you Google Taco Cupcake you'll find LOTS of different kind of recipes. 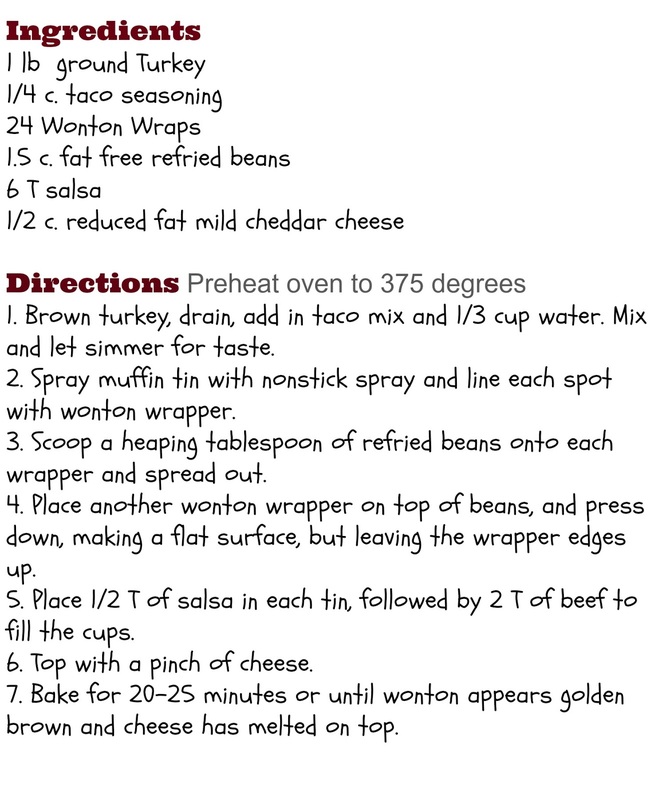 I tweaked mine from the original, so you can really adjust the recipe to your taste..I kind of want to try these with those meat-free beef crumbles...that sounds kind of interesting! My only real gripe with the wonton wrappers is that in the cupcake tin, they didn't crisp like they should have but, the crispy top and the soft bottom make a really nice textural contrast, so I really liked it! Also, as a tip, use a regular sized cupcake tin, the wrappers fit better in that then a jumbo pan and you don't have to fiddle with them in the mini tin. As you see the cups is how I served them, so they aren't pretty but they taste awesome. When I make these again, I'll probably leave out the salsa because it just didn't do anything for me, nor could you really taste it once it was cooked, but I will definitely leave that decision up to you! I hope you all enjoy! Let me know if you try these out and what you think of them! Holy cow, this sounds amazing! I will definitely be trying this out. They really were/are! I kind of became obsessed with Wonton wrappers after this! They're really yummy! 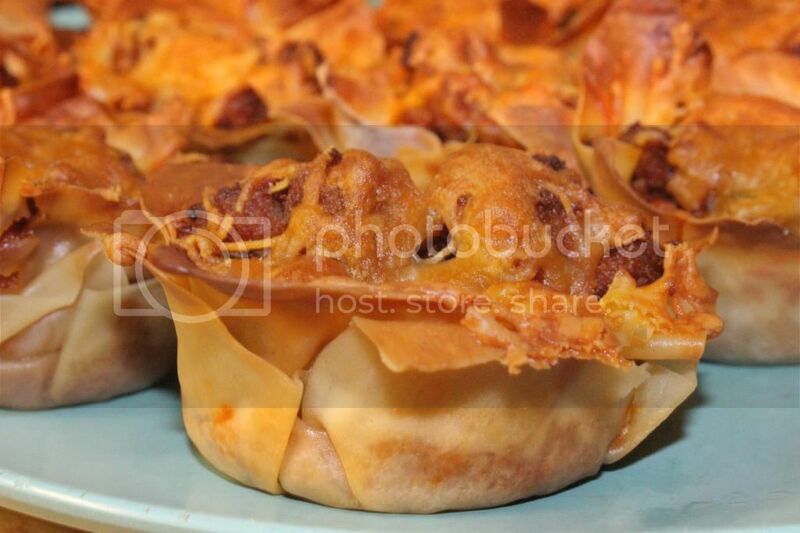 I've seen recipe's for Lasagna ones using the wontons that i want to try out! I hope you like it! I would LOVE to know what you think about it with your soy crumbles! I actually thought of you as I typed this and def. wanted to try it vegetarian style!